Fifty seven years after development work first began, there is still something magical about this iconic electrostatic. Thanks to its combination of superb sound quality and elegant styling, the ESL-57 offered outstanding clarity compared to other loudspeakers of its day. BBC engineers were seduced by its exceptional transparency and speed, and soon adopted it as a reference monitor. Many decades later, this loudspeaker is still thought by many as one of the greatest transducers ever made, and has a huge army of fans. The Acoustical Manufacturing Company Ltd. was founded by Peter J. Walker in 1936, and was soon forced to move from London to Huntingdon in the middle of World War II when its factory was bombed. After the war, the company renamed itself QUAD, short for ‘Quality Unit Amplifier Domestic’, and focused on the domestic audio market. As well as launching valve pre- and power amplifiers, the company introduced its first loudspeaker in 1950, the CR corner ribbon. This was an interesting hybrid design using a Goodmans Axiom 150 cone mid/bass unit and an electromagnetic ribbon loudspeaker, designed by Acoustical, for the higher frequencies. Peter Walker soon began work on the ESL-57 full range electrostatic. Essentially a large wooden frame into which three panels were screwed, each panel was an electrostatic transducer made of treated polyethylene terephthalate (commonly called Mylar) film stretched over a wooden frame. The film had a mildly electrically conductive paste and sat between two stators, both of which received a very high voltage which effectively ‘shook’ the film, producing the sound as the charge varied. The ESL had a single treble panel sitting between and slightly behind two bass panels, one either side. Behind these, at the bottom of the back of the frame, was the transformer. This arrangement gave it that striking planar shape, with a distinctive metallised grille for protection. Becauset Mylar film was so light, the sound that was produced had excellent transients and very low colouration. This was further aided by the lack of a conventional cabinet with its boxy artefacts – that meant a wonderfully linear bass down to about 45Hz with no boom. Even now the original Quad electrostatic sounds superb in its way, with uncanny insight into the music, allied to the ability to serve it up in such a linear way. The best way of describing it is as a wide open window through which you can peer. It’s not one of those ‘character speakers’, like a classic JBL or B&W – rather it just lets the music waft around you in a polite, genteel, matter-of-fact but nevertheless engrossing way. The only issue with a fully working ESL-57 is its sound pressure level, or lack thereof. It simply isn’t as good as modern speakers in handling monster solid-state amplifiers. 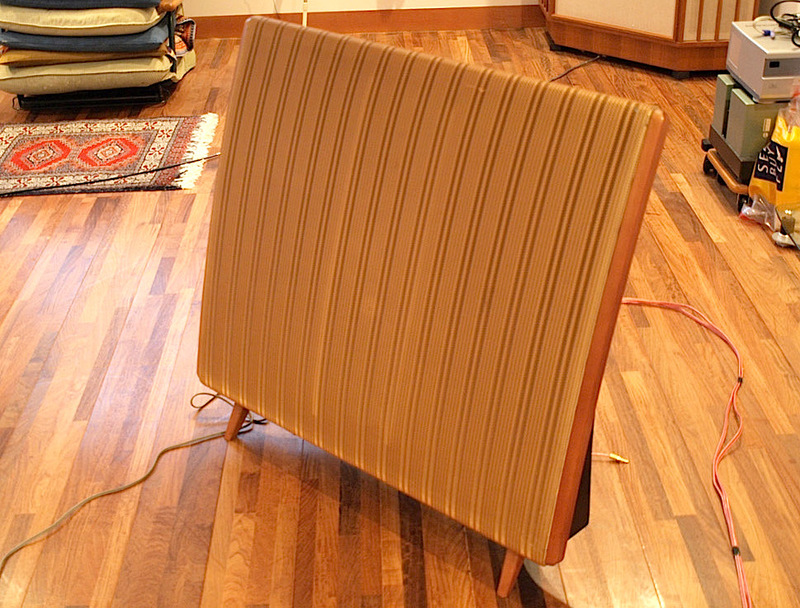 The speaker has a tendency to break up, or at least sit on dynamic transients, at quite modest listening levels. Pushed really hard, it will start arcing, the stators ionising the air and sparking through the Mylar film. This will soon kill the panels, and despite Quad later fitting protection circuitry it was one of the reasons that the Beeb moved to other monitor speaker solutions. It is also the main reason why many ESL-57 aficionados used stacked pairs, famously such as SME’s late Alastair Robertson-Aikman. By using four instead of two, the speaker is able to move an awful lot more air, in a decidedly more relaxed way. Find the ‘sweet spot’ in the room and the soundstage snaps into focus like almost no others. Suddenly the whole music grows in stature to engulf you, and you feel so close to it that you can see the whites of the musicians’ eyes. Everything is so open and effortless, and the result is a marvellously entertaining listen. It’s these core competencies of transparency, openness and insight that the Quad Electrostatic does so well, and these in turn means the brain has to work much less hard than when listening via most box speakers – whose constant booming, banging and clanging cause fatigue and distract the listener from the musical performance. The wonderful, all-of-a-piece sensation of a well sited pair of ’57s is a joy to hear. The biggest obstacle to owning a pair of Quads isn’t price, it’s having a room that’s big enough to get the best from them. They radiate sound both forwards and backwards, which is why you’ve got to move them well out into the room, away from the back wall which reflects the rear waves. This done, they can breathe – imaging better and delivering higher volumes more effortlessly, and you you’ll also find the midband cleans up a treat, too. They’re a particularly tricky load to drive too, so weak knee’d single-ended triode tube amps need not apply! Later Quad ESL speakers brought improved power handling, better low bass and high treble performance, and a cleaner, tighter sound – but there’s still something very compelling about the original ’57. A well-preserved or meticulously rebuilt pair will give a wonderfully cohesive sound that is musically communicative in a way that practically any other loudspeaker isn’t. It brings you so close to the music, yet does this in such an effortless and matter-of-fact way that you just can’t stop listening. Of course, it is also a design classic in its own right, and is surely one of twentieth century’s most special products – not just for what it was, but for what it can still do today. Those shopping for one will know that used prices vary enormously; for a half-decent and well-preserved pair with sequential serial numbers, you’re starting at about £500. At this price though you should think about getting the panels rebuilt and the electronics serviced. By far the best place I’ve encountered is One Thing Audio, who can refurbish and/or upgrade every part of the speaker; prices range from around £150 to £1,500 depending on the work you want doing. Suffice to say that a fully modded One Thing Quad ESL-57 is one of the best loudspeakers I have ever heard, with dazzling clarity, speed and rhythm. These speakers sound awful! They sound awful placed against walls or in the corners of rooms. They sound awful if you drive them with transistor amplification, of any grade or specification. They sound awful unless you’re placed horizontally and vertically in the one and only sweet spot. They love dust. They can buzz irritatingly. Not a whole lot to like then, is there? Not for everyone then, the ESL57, but given the right circumstances it would be difficult to better at any price. I love planar speakers and Quads are really special. Never owned a pair but I have friends who do. I see people raving about them and I fully understand the reasons why, ESLs have transparency, timbre and coherence that’s unmatched by regular “boxes”.